A combination of factors have seen the cost of running a vehicle jump by €18 a month in the last year. 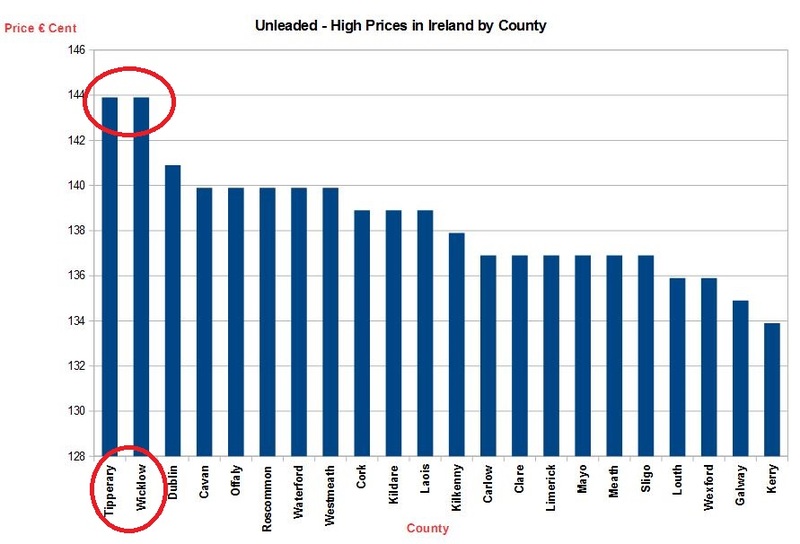 LAST WEEK IT emerged that fuel prices are the most expensive they have been in Ireland for 16 months. 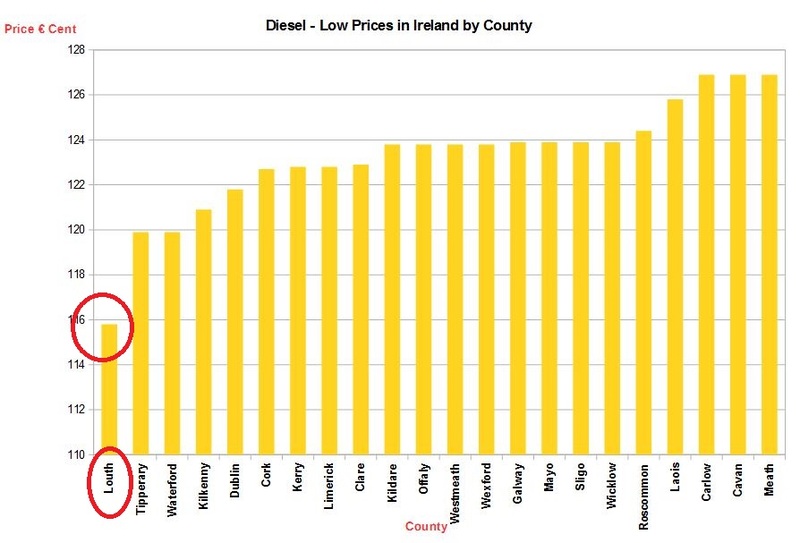 The AA’s price tracker (which can be viewed here, and tracks diesel and unleaded costs as far back as 1991 when the sector was deregulated) suggests that at present, at €1.36 per litre unleaded and €1.27 diesel, costs are the highest they’ve been since August 2015. That equates to €18 more for a month’s worth of petrol year-on-year. That’s a significant increase by any standards. But what causes the fluctuations? Are we at an all-time high in the annals of petroleum-expenditure? And is there any cheap fuel to be had? TheJournal.ie took a closer look at one of the most fundamental of consumer benchmarks. To kick things off, no, we are not dealing with unprecedentedly high levels of petrol costs. 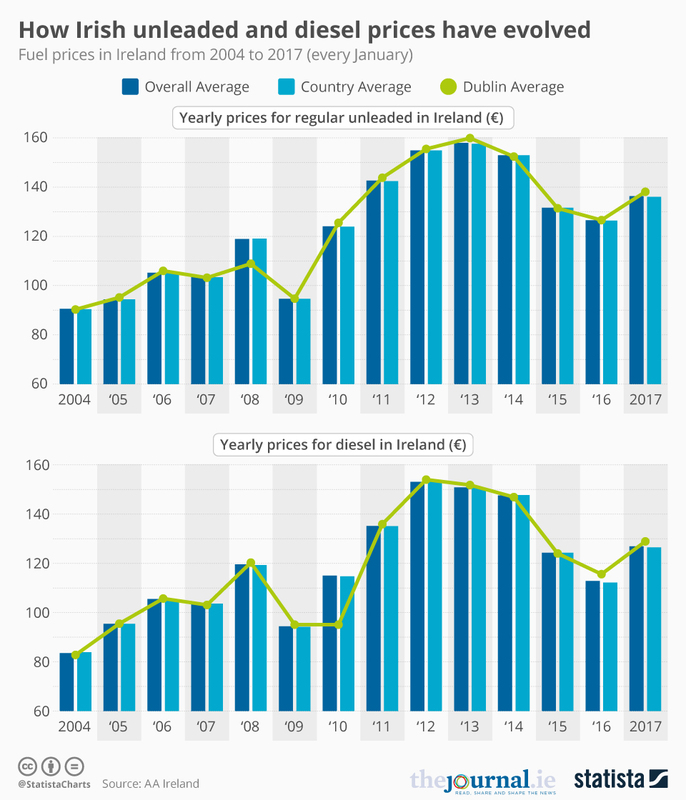 We are at our highest peak in 16 months, it’s true, but that’s nothing compared with the highs of end-summer 2012 when demand greatly outstripped supply and unleaded petrol breached €1.70 per litre in Ireland, and diesel €1.60. Looking back to the dire days of 2008, prices were also higher than what’s being seen at present. In July of that year a litre of diesel would set you back €1.44 – comfortably more than what’s being seen right now. As you can see, prices here (and in most places) are cyclical – and haven’t really varied all that much when the period is taken as a whole. And while costs can certainly be affected by times of recession, that is far from the only relevant factor. Before we get stuck into that, it should be said that while the AA’s figures represent the average prices seen nationwide, there does appear to be a deal of variance in what is being charged across the country. 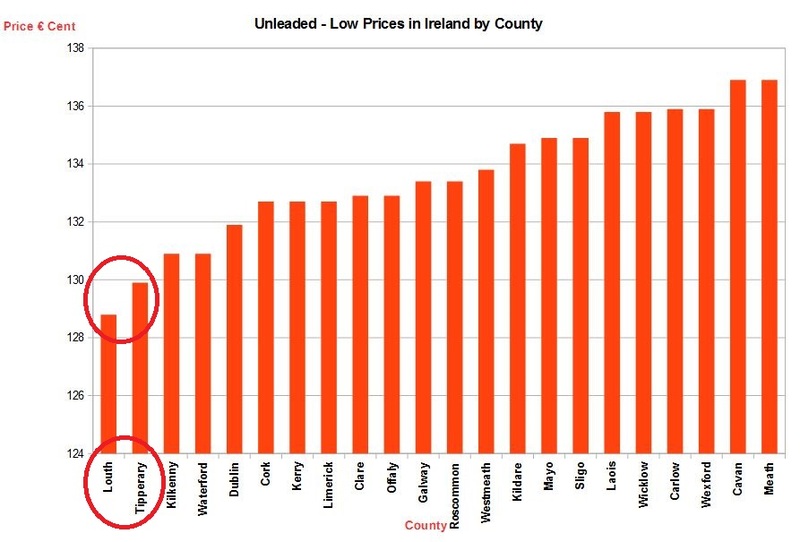 Using crowd-sourcing site Pumps.ie (with only data uploaded by users in the last three days applicable), the worst offenders in terms of high prices are counties Tipperary and Wicklow with unleaded and diesel high watermarks of €1.439 and €1.359/1.349 respectively being seen at filling stations there. 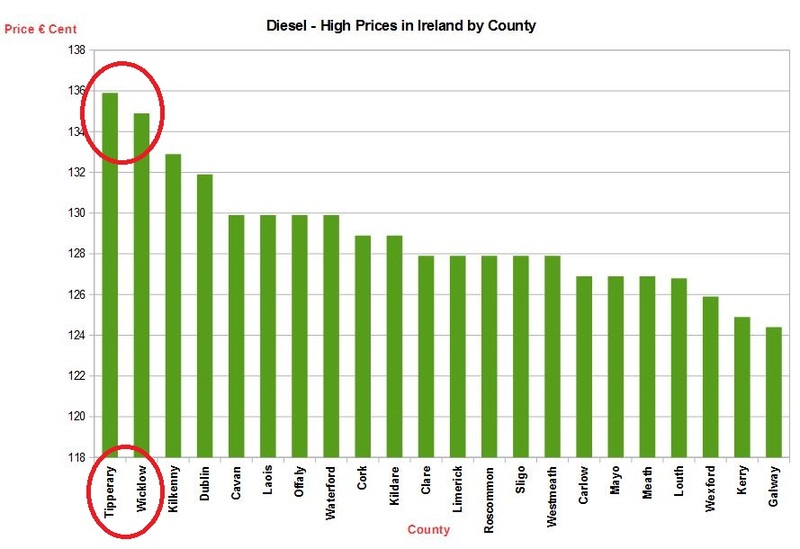 However, the lowest prices being seen around the country at the moment are fully €0.15 and €0.20 less than those high points for unleaded and diesel fuel respectively. So, there’s bargains afoot if you care to shop around (or drive some distance to fill your car). The lowest prices can be found in Louth and, oddly enough, Tipperary (again) at €1.288/1.299 and €1.158/1.199 for unleaded and diesel. Variable prices in the Premier County. Back to the factors affecting fuel prices. Crude oil is a different kind of commodity from electricity and gas – the prices of which are factored in some time in advance – hence the reason why domestic heating bills can take their time reflecting global market conditions. Oil is far more immediate. Founded in 1960 (by Iran, Iraq, Kuwait, Saudi Arabia, and Venezuela), OPEC consists of 13 nations, which as of 2015 account for about 42% of global oil production (as opposed to the world’s actual oil reserves – OPEC controls about 73% of those). So when that organisation acts on the supply of oil (at present a barrel goes for about $55), it’s a case of it sneezing and the world catching a cold. That’s exactly what it did in December, and it’s probably the single biggest reason why prices have risen recently. “In December they said they would cut back supply to push the price back up again. They had said previously that they weren’t going to do that this time, but now they have,” says Lisa Ryan, professor of economics at UCD. They wanted to keep selling. Basically they had so much fuel it made sense to sell the whole load of it. They were afraid of losing market share as now OPEC has competitors. Such as Russia. In the long term, it won’t work out that way but at the moment that is the case. “That doesn’t change production – it’s more of a short term thing. The amount coming out of the ground is unlikely to be affected,” Ryan says. So, the price of a barrel of oil increases, and our local retailers pass that increase onto the consumer? They have the weak pound and Brexit, and that’s likely to continue for the foreseeable [future]. “In terms of the local community, it really tends to come down to whether or not the seller has a competitor nearby or not. If there isn’t one, prices tend to be higher,” says Ryan. There can’t be anything orchestrated about it because then you’re dealing with a cartel. Ryan says “you have to remember that nearly 70% of petrol price is excise duty and taxes – only about a third of it can be affected by the wholesale price”. It’s not the petrol that local stations are making money from these days – it’s the shop. That’s why you’re seeing bigger and bigger forecourts around the country. It’s where the money is to be made. She suggests that in terms of taxes and excise, the AA itself will argue budget hikes seen in recent years were emergency measures for emergency situations (Ireland’s recession), and now the emergency has receded but the charges remain. She’s correct in this assumption. Conor Faughnan, director of consumer affairs with the association, thinks that “what’s changed is Ireland has added tax on top of wholesale charges”. “Since the emergency budget of October 2008, there have been five separate tax increases applied to both unleaded and diesel. That emergency is over, the taxes should be over too,” he tells TheJournal.ie. He agrees, however, that the current increase in prices isn’t unusual. “Prices were also significantly higher in early 2015,” he says. Now though, we have a carbon tax. There’s no real difference between that and excise duty, it’s just called a carbon tax to make it smell nicer for the public. Faughnan argues that the removal of such taxes is what will bring down the prices seen at the pumps. “Tax-free petrol would go for between €0.50 and €0.55,” he says. He does acknowledge the external factors also however. Vast fortunes are made and lost speculating on oil. A barrel is bought and sold about 20 times en route to market. Speculators are in the habit of overreacting to what’s going on in the world. A bad headline from the Middle East and it swings one way. The next day it’s the opposite. Add into this oil companies, OPEC, Vladimir Putin, Brexit… it all goes into the hopper. So, are prices likely to rise or fall in the immediate future? Lisa Ryan doesn’t think that is necessarily the way the world is going however. An expert in renewable energy, she believes that people will eventually seek their savings elsewhere. “In the US you always had huge cars, then when oil was at its highest in the early 2000s there were far less SUVs on their roads,” she say. But if people see prices going only one way, they’ll think twice when buying a car. And they’ll drive less. Long term, we’re going to be using electric vehicles, even if it’s a case of using one for short-haul driving. More intriguingly, she can see a future where we don’t bother to own a car. “It’s cheaper to rent a car if you hardly ever drive,” she says. “That’s fact. That’s where a business like GoCar (on street car rental – the same principle as Dublin Bikes for cycling) could be very useful to someone who cottons on to what their expenses are,” she says. Taxes, insurance, upkeep – it all adds up. Even taxis are cheaper really. This is the future, when people look at the cost, they may decide accordingly. Email “Filling your car is becoming very, very expensive - here's why”. Feedback on “Filling your car is becoming very, very expensive - here's why”.